The date was 18 August 1940. The Luftwaffe was mounting a low-level bombing raid on RAF Kenley airfield in Kent using nine Dornier 17s from a base in France. At levels below 100 feet above the ground the aircraft coasted in at Cuckmere on the south coast of Sussex. Their route was to take them to their next turning point at the town of Burgess Hill. Immediately before reaching this point they flew directly over the Sussex village of Ditchling watched by a young girl, Dorothy Moore, who lived in East End Lane. It was reported that one of the aircraft was so low that it took the top off a tree in her father’s garden. 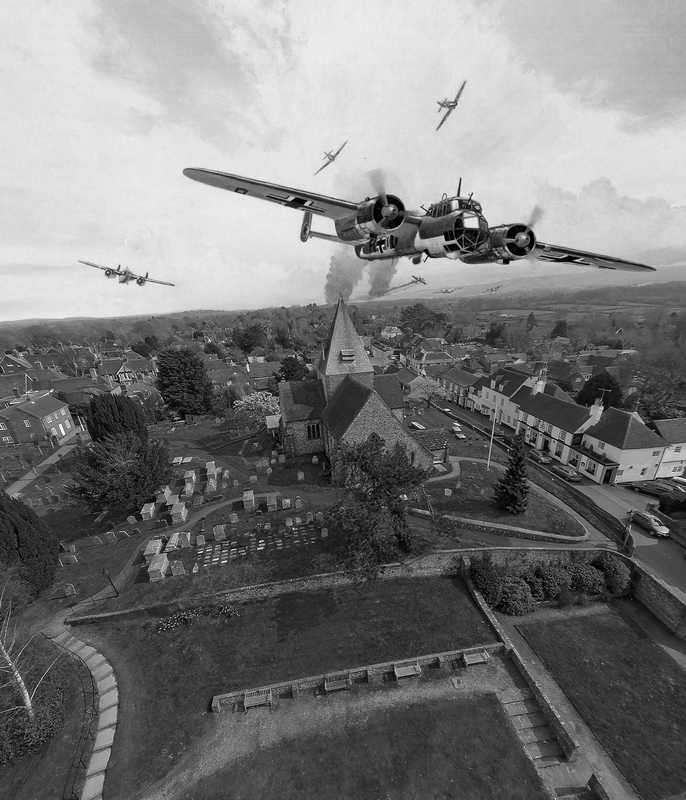 This image is a montage of a photograph of Ditchling shot from a small radio-controlled aircraft together with a painting by Mark Postlethwaite of a flight of Dornier 17s on a low-level raid. The angles of view of both images were nigh on perfect for a montage.